Provide comfort for the family of Marie Cuffie with a meaningful gesture of sympathy. On January 24, 2019, God reached down from Heaven in his garden and picked one of His beautiful roses, Marie S. Cuffie and took her to her eternal home. Marie was born July 17, 1926 to Walter and Ola E. Singletary in Jacksonville, Florida. Marie received her education in Baldwin, Lake City and Callahan, Florida. At the age of 24 she accepted Christ as her personal Savior at the Mt. Ararat Baptist Church, under the leadership of Rev. Dallas J. Graham. She later joined the King Solomon United Baptist Church, under the leadership of Rev. Dr. William C. Barker, Jr. At both churches she was a faithful member, served on the Usher Board and Deaconess Board until her health began to fail. Marie was preceded in death by her husband, parents, sister and son. 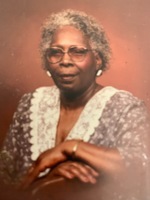 Marie leaves to cherish her beautiful life: 4 loving daughters, Ola S. Allen, Carolyn S. Lewis, Sharon M. Johnson (Clearence), and Vanette C. Wells (Nicholas); 6 grandchildren, Pastor Cedric Singletary (Sabrina), Larry Gardner (Pamela), Melissa Allen, Jonathan Wells (Briyanna), Brandon Johnson and Jamal Wells (Sierra); 8 great-grandchildren, 11 great great-grandchildren; nieces, Lavern Miller and Rozell Swain; nephew, Bernard Williams; god-daughter, Denise Gomillion; dear friends, Minnie Campbell, Irma Rucker, Mary Thomas, Deacon Frank and Patricia Williams and a host of other relatives and friends. To send flowers in memory of Marie Singletary Cuffie, please visit our Heartfelt Sympathies Store. Provide comfort for the family of Marie Singletary Cuffie by sending flowers. We are saddened to read of Ms. Cuffie's death. Allow us to impart some good news that tells what the Bible promises for her future. Psalm 37:29 assures us that "the righteous will possess the earth, and they will reside forever on it." Take a moment to envision the Cuffie family on God's restored paradise earthly home enjoying the happy, peaceful, healthy life that he purposed for for us. May you strengthen each other's faith in the fulfillment of God's promise for all obedient mankind including Ms. Cuffir!--Revelation 21:3-5.